Article by Maria Tadeo (Blomberg Business), click here. Spanish unemployment fell to the lowest since 2011 in the third quarter, boosting Prime Minister Mariano Rajoy’s campaign ahead of an election pegged to jobs. The jobless rate dropped to 21.2 percent from 22.4 percent the previous quarter, the Madrid-based National Statistics Institute said Thursday. 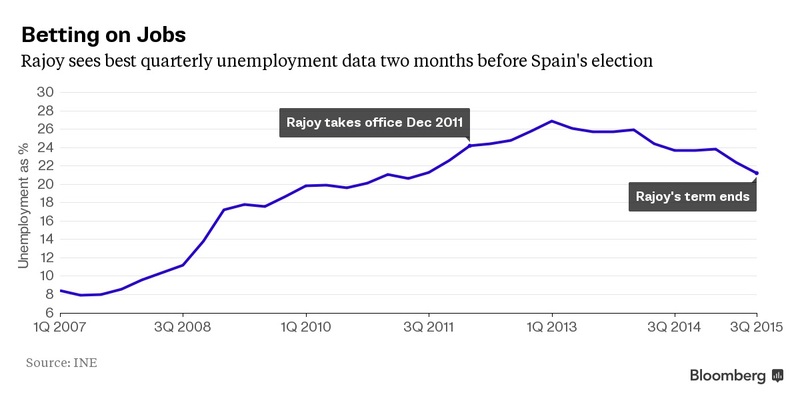 Despite the improvement, Spain still has the second-highest unemployment rate in the euro area behind Greece. A surge in temporary hiring saw the Spanish economy add 182,200 new jobs in the three months to September, which includes the crucial summer hiring season, led by the services and industry sectors. Over the past year, the country has created more than half a million posts, taking the total number of Spaniards working to 18 million. 18,900 in the quarter, highlighting the split between mainly young workers with little protection and those in stable positions. The decline in permanent contracts shows the recovery has yet to translate into well-paid, secure jobs, the Union Sindical Obrera union said in statement. The data should give Rajoy some respite as he races to win over disenchanted voters before a general election set for Dec. 20. Hindered by the legacy of austerity, an unpopular labor market reform and corruption allegations surrounding his party, he is making job creation the centerpiece of his campaign. “Rajoy will argue that the recovery is safe in his hands with benefits now more apparent,” said Raj Badiani, senior economist at IHS Global Insight Ltd, pointing out that the pace of job creation was better than expected in the quarter. Thursday’s data marks the final quarterly unemployment survey before the election. Facing competition from its traditional rival, the Socialists, and new groups, including Podemos and pro-market Ciudadanos, Rajoy is presenting himself as the only candidate who can ensure the recovery. Polls show no party obtaining an outright majority in parliament. 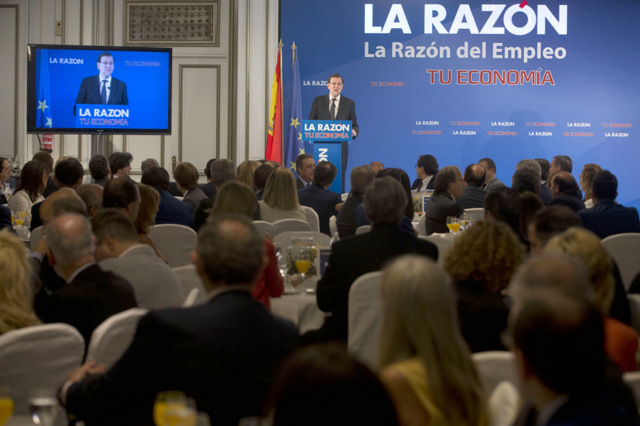 Speaking to reporters at the European People’s Party gathering in Madrid Thursday, Rajoy said the unemployment data is a step in the right direction for Spain. He said economic policy should stay on track as December elections loom. The Spanish government sees unemployment falling to 19.7 percent by the end of 2016 — in line with the Bank of Spain’s estimate. The European Commission, which called into question the country’s economic projections in its budget review, sees unemployment at 20.5 percent for the same period. Catalonia – Roadmap to Independence? Spain is back on its feet – Growth has returned.